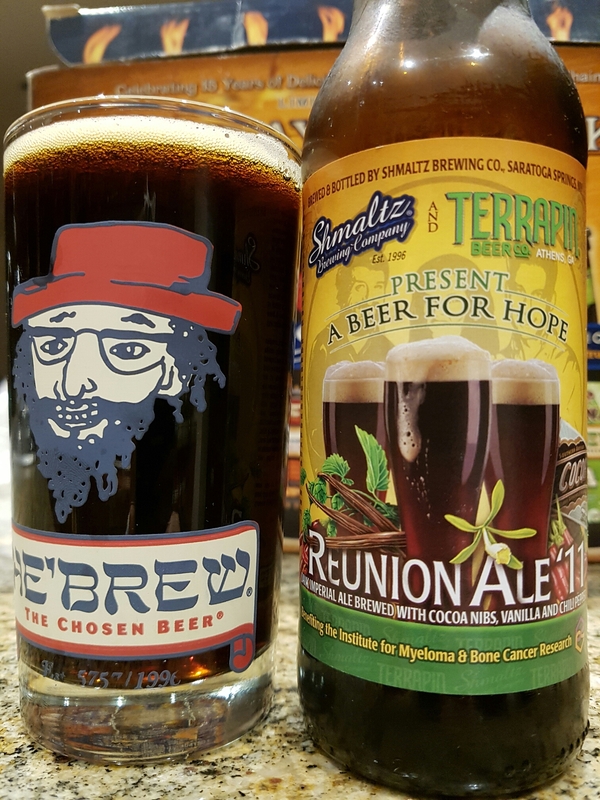 Reunion – A Beer for Hope 2011 – Shmaltz Brewing Co & Terrapin Beer Co Collaboration | Justintoxicated. Teaming up with Terrapin Beer Co. for the first time, Shmaltz Brewing joins the tribe as a production partner for Reunion ’11. We brew Reunion each year in memory of our dear friend and partner in this venture – Virginia MacLean. Virginia lost her battle with Multiple Myeloma in 2007. It was her wish that we continue to raise finds and awareness on behalf of The Institute for Myeloma & Bone Cancer Research (www.imbcr.org). This year’s beer is a dark, complex ale brewed with cocoa nibs, vanilla and chili peppers. It was inspired by a fantastic dessert that we used to share with Virginia at our favorite restaurant. This brown ale leads with a sweet and subtle spicy aroma. The flavor begins with complex malt overtones and quickly gives way to a chocolate and vanilla mix of satisfying bliss. Just when you thought it was over, the heat from the chilies sneaks in and coats your tongue with tantalizing heat. 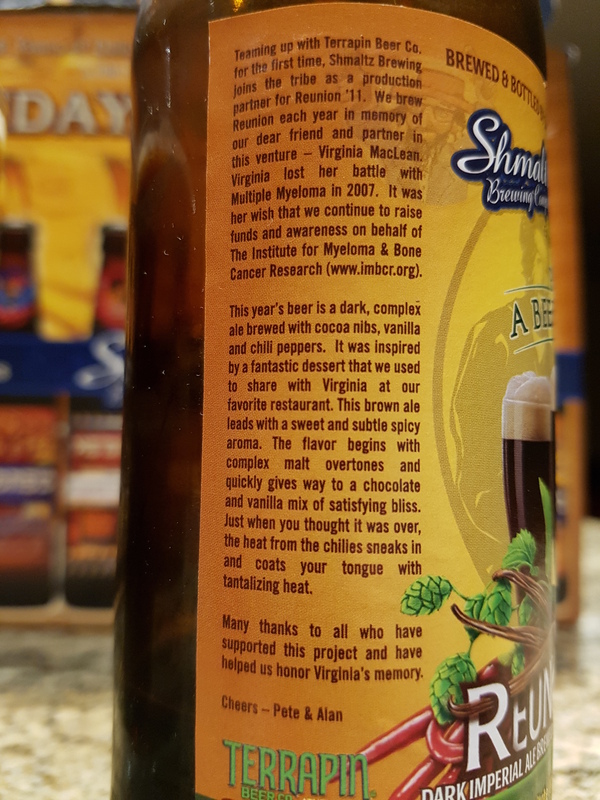 Many thanks to all who have supported this project and have helped us honor Virginia’s memory. Visual: (cellared for 4 years). Pours dark brown with a smallish lasting 2mm foamy head, clusters of fast activity. Finish: subtle chili heat, bitter dark chocolate exhale, residual caramelized barley malt sweetness, subtle hops. Summary: Lots of flavours going on working in unison for a delicious cause. Interesting taste profile thought just a tad sweet. Very nice.